I came to this series as a child on the recommendation of my mother, who knew my love of science fiction. Listening to it in audio format is great in it's own right - Ms. Barbeau's diction is crisp and well inflected. if you haven't heard or read this series, you should! I only have one complaint about this two-in-one volume, and that is that they are out of order chronologically. 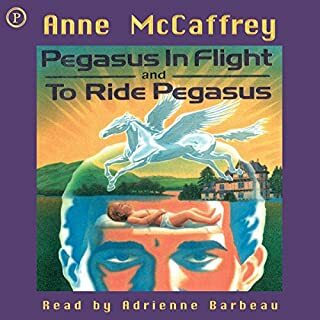 To the new listener, I highly recommend skipping to the "middle" of the audiobook and listening to "To Ride Pegasus" first before going back to listen to "Pegasus in Flight." You might get thrown off by a several decade jump backwards in time otherwise!